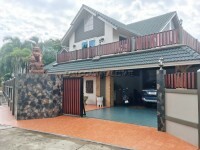 This house is located on 312 sq.wah stand alone plot nearby Mabprachan Lake. It is consisting of 4 bedrooms and 5 bathrooms and comes with quality fitted European style kitchen, massive open plan living and dining areas. 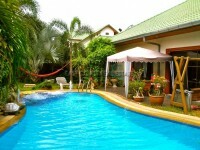 Large swimming pool and gardens. Outdoor SALA by the pool. Underground private well and reserve water supply. It is located in a nice open family environment, plenty of local shops, International schools, and excellent highway routes to all of the surrounding provinces. For RENT long term only with 2 month holding deposit. Living area : 33 sqm.